“Scouting was a wonderful experience for me"
The Chicago Sun-Times reports that Barbara Wilbourne, 82, of Savannah, joined one of the first African-American troops there in 1941. Her original pin, membership card and a vintage photo of her as a troop leader are on display at the Girl Scouts First Headquarters in Savannah, a national landmark site. Visiting Chicago recently for Black History Month, she shared her experiences with dozens of Girl Scouts who gathered Saturday to hear her at St. Mark United Methodist Church in the Chatham neighborhood on the South Side. 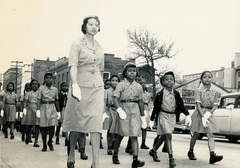 “Before 1943, Savannah was segregated, and Afro-American Girl Scouts did not exist,” she said. “Scouting was a wonderful experience for me. With God, family and Girl Scouting, I have been helped to become the person I am today. Scouting experiences helped me to learn how to get along with people, develop good study habits and a deep love for God, and it helped me to become a good citizen and an understanding mother."